This post includes takeaways from a ‘MOOC Jam’, a synchronous discussion online I participated in with a group of educators about digital pedagogy. This past Tuesday, I participated in a MOOC Pedagogy Jam via the website Momentum, a platform created for stakeholders to discuss critical issues related to education, sponsored by the Bill and Melinda Gates Foundation. The purpose of the platform is to provide a space to host online events about topics related to online education, with the ultimate goal of the Jams ‘to gain perspective and solicit ideas that inform the community’. I participated in the first MOOC Jam this past November. The topic, “Peer Review of a Framework for MOOCs” hosted by George Siemens, focused on the design of the MOOC Framework. Siemens, creator of the Framework, sought input from the community of participants. The topic of this Jam, [which turned out to be more of a synchronous discussion] was digital pedagogy, divided into the three threaded discussions as mentioned above. Each discussion featured a moderator, responsible for responding to participants and furthering the discussion, and another moderator summarizing key themes of the discussion each hour. I chose to participate in ‘Competencies for teaching online: describing effective pedagogy’ given its description— “An exchange on how information is delivered to students, how they are engaged as active learners and community is built and how learning is assessed”. Following are my insights from the discussion on digital pedagogy and I’ve included comments from other participants. (Jam II, Momentum, Digital Pedagogy). The discussion was rich with ideas, insights and provided a glimpse into the issues and challenges with online instruction. Though the title of the Jam featured ‘MOOCs’, much input from contributors pertained to closed, online courses which created an interesting discussion by highlighting one of the primary challenges in online education—the application of appropriate pedagogical methods, which will vary depending upon the learners, the delivery method and goals of the course. 1) Part of the discussion was devoted to the contrast and challenges between learner-directed and instructor-directed learning. The fact that much discussion focused on this issue highlights one of the challenges with MOOCs; a MOOC, due to its scale and format lends itself to be learner-directed. It’s not surprising then that MOOCs attract learners that already know how to learn, are motivated and educated. Several Jam participants discussed methods to get learners involved in learning, how to encourage students to engage and participate [typically in the context of closed online classes]. I see the above challenge highlighting two opportunities: 1) to provide support to students to learn how to be self-directed, and 2) to provide skill development for educators and course designers in how to be flexible and adapt instructional strategies by assessing learners, the learning context and creating appropriate learning experiences, implementing pedagogical methods that match the learning needs. One Jam participant shared an initiative that his institution recently started for its students; a program designed to address much of what was discussed here. 2) Considerable discussion focused on how to get students to interact, collaborate and engage with peers in online classes, and what the instructors role is in facilitating group formation, participation and learner engagement. Though this theme is similar to the theme mentioned above, interesting thoughts on group formation and collaboration emerged—should it be encouraged, facilitated or left for students to form spontaneously? And if so, how? This relates to the motivation of the learner, which is quite different when students are in for-credit classes versus ‘free’ and open classes [MOOCs] that are driven by interest and desire to learn—essentially self-directed. The comment above is interesting—is it really possible or desirable in a MOOC environment that the responsibility for group accountability and productivity rests with the instructor? 3) The session wrapped up with discussion that focused on supporting learners, helping learners to learn in a MOOC format. The question appears to be—how can this be accomplished, is it through course design, or while the course is live, accomplished via course facilitators? Or do we need to teach students how to learn in a MOOC? Discussions, similar to those within this Jam, create excellent opportunities to get the issues and challenges facing education, specifically online education, out in the open. It also helps stakeholders identify what needs to be discussed and explored within their own institutions. There are commonalities across all institutions when it comes to online education, and ironically the very barriers affecting these issues, exist within institutions at all levels. Fortunately there is progress—many institutions are experimenting, collaborating and striving to adapt to cultural shifts, increase access, yet still provide high quality, relevant education. Are there similar discussions happening within your institution? There are radical models in higher education worth examining that challenge the conventional model of undergraduate education; the traditional model representing a four-year on-campus program that includes instruction by faculty or teaching assistants, institution-determined course selections guided by the credit-hour formula, transcripts with GPA calculations, etc. Yet there are countless articles and posts that cry out for reformed models of higher education, even more that provide suggestions and remedies. Yet there are few models in practice that offer face-to-face education experiences that are truly transformational. However, I suggest the four models presented here are worth pondering; two created from scratch, and two that changed within an existing framework. To reiterate, the institutions discussed here are not virtual schools, each provides face-to-face undergraduate learning experiences where technology is leveraged to facilitate learning. The schools are also committed to teaching foundational subjects—courses from the humanities, yet each provides unique learning experiences that challenge the traditional model in some way. Each institution takes a different approach, though all encourage learners to choose a learning path, to be self-directed, to follow their interests, and establish their own learning goals. All seek to engage young people in learning, prepare students to think critically and to guide them to find their passion. Why should educators concern themselves with considering non-traditional models of higher education; models that appear far-fetched and irrelevant? It’s becoming apparent that the current model needs to change, and change for several reasons. First, the majority of existing models at four-year higher education institutions are not sustainable. For the past two years we have heard about the bubble of higher ed, the rising costs that are pricing college education out of reach for many. It’s coming true as predicted. According to a report described in The Chronicle of Higher Education, 28 percent of public institutions, compared with 15 percent the year before, expect declines in their net-tuition revenue. Already several private institutions have taken drastic measures in response to declining revenue as reported in Inside Higher Ed. Second, the four institutions described here offer a different perspective on education; a lens that provides a glimpse into what higher education might look like in the future—food-for-thought. Third, some argue that there is a gap in what the current higher education institutions offer students; not only are many students excluded from higher education for a variety of reasons, but there is a lack of preparation for students to be effective as a post-graduate. Many are ill-equipped to find meaningful work in the knowledge and global economy. 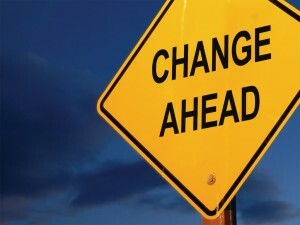 Change is hard to do, and not just for higher ed. Deloitte’s Center for the Edge for the past three years has published a report that describes the ‘Shift Index‘ which provides metrics that signal changes in order for institutions and organizations to identify long-term trends, and plan accordingly. What is interesting is how applicable the content of the 2011 report is to higher education. The full 2011 report is here, but one interesting fact applicable to higher education is this—”the price/performance capability of computing, storage, and bandwidth is driving an adoption rate for our new “digital infrastructure” that is two to five times faster than previous infrastructures, such as electricity and telephone networks.” Furthermore, it appears individuals (i.e. students) are having a far easier time keeping up with the changes than are the institutions and organizations. It is far more challenging for organizations to remain nimble, yet still quite necessary. The point is, there are significant implications with the Big Shift we are experiencing, and it’s consumer, student, employee, life-long learner behaviours and their adoption of technology that will shape institutions, organizations and businesses of the future. It will be organizations [i.e. higher education institutions] that adapt and harness the new “knowledge flows” that will be successful, and “doing so will require significant institutional innovations” (Kulasooriya, Brown & Hagel, 2011). Below I provide a summary of each the four schools, and highlight why each is radical in context of conventional higher education. Though there are other higher education institutions implementing new models, many embracing technology and responding to the needs of students, the four presented here were chosen because of the uniqueness and diversity. 1) Quest University Canada. I heard Quest University’s Vice-Chancellor, David Helfand speak at a conference in November where he described the school he founded. Quite remarkable. Quest started with its first class in 2007 with 73 students. Classes are small. There are no lectures, but all classes are seminar-discussion format. All students complete the same foundational courses in the first two years that cover the humanities, math and sciences, yet the latter two years are unique and individual learning paths chosen and directed by the student. The selection process for professors is most unusual, and all work in an open office where there is no separation by academic schools or disciplines. Why it’s radical: there are no grades; students receive check marks to indicate if they are engaged in learning. The study path for the last two-years of the undergraduate degree program is a unique learning path chosen by each student based upon his or her personal interest/passion. Quest at a glance. 2) Liverpool John Moores University, United Kingdom. Founded in 1825 started as a Polytechnic, and in 1992 the school became Liverpool John Moores University, one of the UK’s new generation universities. This is a research university, that launched ‘a globally unique model of higher education that stresses work-related learning and ‘skill development in tandem with effective employer engagement’. Why it’s radical: the university’s program, World of Work is a support and skill development program for all students that involves involvement and input from national and international employers and business experts. Students not only gain work experience with top companies, but students develop a skill-set labeled World of Work skills. Students abilities are also verified through an employer-validated Skills Statement and interview during their undergraduate course of study. More info here. 3) University of Technology Sydney (UTS), Australia. UTS is one of the largest universities in Australia and aims to be a world leader in technology education. The focus is on global, practice-oriented learning where students undertake research, professional and community work experiences. It is heavily focused on collaborative learning that integrates institutional research. Why it’s radical: the hands-on learning approach beginning in first-year of study, and the school’s updated learning strategy for 2014 includes student-generated learning goals, personalized learning paths that integrates online sources, faculty feedback, and development of a personal learning network using digital platforms and tools (three-minute video clip that describes the approach: UTS 2014). UTS undergraduate information. 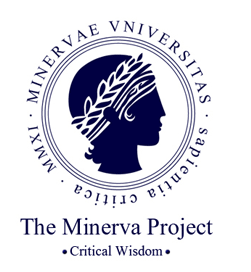 4) Minerva Project, United States. I hesitated to include the Minerva Project here, as this school has long been in the planning phases, and has only just begun to enroll students. However, even if it doesn’t work in this format, it’s worth examining. Conceptualized by Ben Nelson, former chief executive Snapfish the online photo printing site, Minerva seeks to be an ivy league institution with tuition fees that undercut elite US universities by half while guaranteeing students an education based not in one location, but in six of the cities around the world. Why it’s radical: it’s ambitious—not only does it seek to compete the Ivy Leagues, but provides education in brick and mortar classrooms in cities in different countries. It will leverage technology by encouraging students to access content and resources online, i.e. MOOCs but still include face-to-face interaction. By its very nature, it’s an education in globalization. More here. As highlighted, the schools examined here and the respective models, provide insight into what can be done in higher education to address the Big Shift as described by the Deloitte Center. Though radical as they may seem, each provides a glimpse into how face-to-face undergraduate education is adapted to provide relevant and effective education for a global and digital world. This post explores the significance of student groups in online learning courses—the value and influence on institutions in light of the principles outlined in Shirky’s book “Here Comes Everybody”. 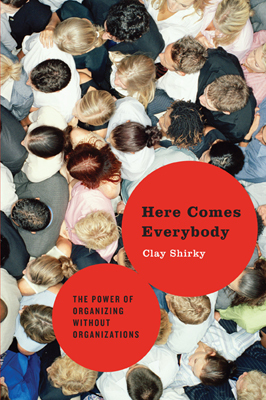 I just finished reading Clay Shirky’s book Here Comes Everybody, The Power of Organizing Without the Organization. You may wonder how valuable such a read would be given the book was written in 2008, yet reading the book with five years of Internet advancements under our belt, was strangely thought-provoking. More so when considering the influence and power that groups can, and have wielded in the realm of online education, specifically in courses attracting massive numbers. Here I’ll share the potential that groups hold for learning within online courses, the three principles needed for successful groups, and how student groups are subtly influencing the paradigm shift in education. Shirky is a professor, journalist, author; he studies and writes about the effects of the Internet on society from a cultural and economic viewpoint. Several recent articles written by Shirky have caused some educators to bristle. In a blog post from 2012, Napster, Udacity, and the Academy Shirky compares higher education to the music industry, suggesting that the MOOC model, or some version of it, will replace higher education as we know it. Yet my focus here is not on Shirkys’ views on education, but his insights on group formation which is particularly relevant in light of learning online in massive courses. The Promise is what brings the group together, around a topic of interest with a basic desire to participate. Implied in the promise is that each member will participate and contribute. The Tool is the platform that will help people approach the problem/topic together. Usually a leader [organizer] emerges within a group, or soon-to-be group and chooses the platform for group communication and collaboration i.e. Facebook, Google + Community, etc. He or she will invite members, and/or approve members joining, etc. The Bargain is the guidelines or rules for participating. Group norms are established, i.e. what is acceptable for communication and not, contributions, etc. The organizer essentially established the tone, which influences the culture of the group. I have seen examples of this in virtually every large online group I have participated in; the organizer dictates through actions and tone, which influences the effectiveness of group collaboration and even participation. To collaborate effectively groups need the three components as mentioned. Shirky uses Wikipedia as an example of a large group that demonstrates the three principles. With its tightly knit core group and a commitment to a promise, to create a database of free content maintained by a massive community of contributors, Wikipedia has control built-in by its group norms [the bargain]. An example of the bargain in action, is when one or more of the community of contributors overrides an article written by someone that tries to sabotage its integrity. Enough members care about Wikipedia, which is why it continues to thrive (p 140). Here is where things get interesting. In small, online closed courses, group collaboration is under the control of the instructor—groups actions are structured, guided, even graded as part of a student’s final grade. Group work in this instance can be effective, as instructors can teach students how to participate and collaborate effectively. But in MOOCs learning through group interactions is not within the instructors control, yet there is even greater potential for rich learning to happen with its large, diverse body of learners. 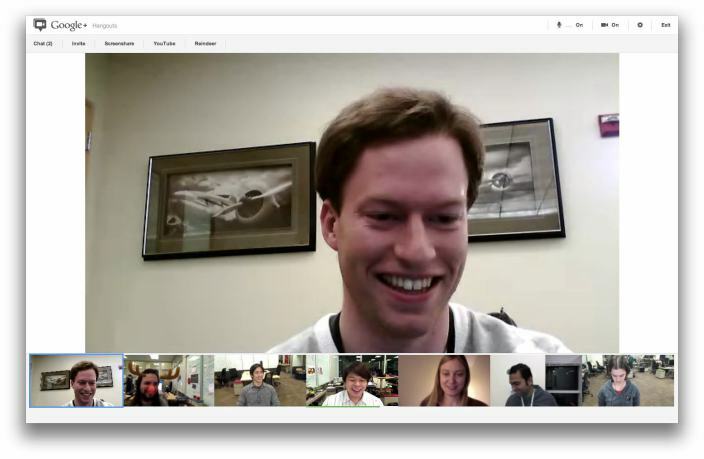 Though MOOC organizers can guide participants and be catalysts for group formation by suggesting participants share, connect and collaborate outside of the MOOC platform. [It’s also helpful that instructors suggest tools to facilitate group work. Though this may seem obvious, the instructor cannot assume that everyone is familiar social tools as a vehicle for learning]. Still, learning within a group in this context is dependent upon the self-direction and motivation of its members. Yet for institutions that offer massive courses, there is a risk. When working with massive numbers of students, not only is group collaboration and learning not guaranteed, there is potential for groups to influence actions and decisions of instructors and institutions in ways that may not be expected, or even desired. Groups have the potential to sabotage the learning of others and the course over which the instructor has little control. Already we have seen the influence of groups within Coursera courses. For example with the Microeconomics course where groups of students were challenging the professor which prompted the professor to quit the course before it was over. Or the Fantasy-SciFi that was sabotaged by a group of students participating in the discussion forums that were working under anonymous profiles causing numerous to be vocal about their negative experience. And the Foundations of Online Education with the thousands of student complaints about the structure and technology glitches, forced it to shut down. We are just beginning to see the power of groups in online learning courses with massive numbers of students. There is great potential yet to be realized, for the development of new knowledge and problem solving with the collaborative efforts of students worldwide. The power of groups cannot by ignored, the influence they have is great, and the institutions that embrace it and acknowledge that they are no longer in control, will be better prepared to create conditions to harness its potential. This post describes how educators can develop a personal learning network that supports meaningful and relevant learning. The MOOC, Education Technology & Media, etmooc, is used here as a working example of how to develop a PLN. I wrote a post recently about how to develop a personal learning environment [PLE], the need and benefits of doing so, for educators in particular. A PLE is a self-directed learning space; a virtual framework that consists of tools to collect, curate and construct knowledge that is customized to an individual’s learning goals and interests. Another dimension of the PLE is the personal learning network [PLN]. Though the two are often used interchangeably there is a difference. 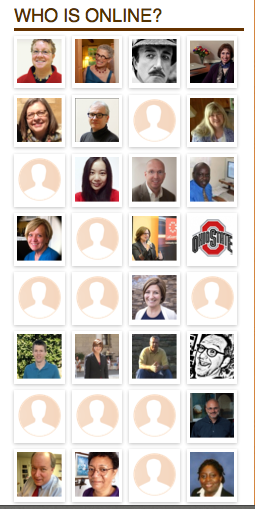 A PLN is an aspect of PLEs, where the individual has a group of people within his or her virtual professional network, and the relationship with each is based upon a common interest, collaborative project or research. Communication and connections are made via social platforms or other Web applications, with the primary intent of sharing or gathering information. Both the PLE and PLN are based on the theory of connectivism, a learning theory conceptualized by George Siemens and Stephen Downes. The premise of connectivism is that the learner connects with nodes [connection points that deliver content or facilitate interaction] within a network, and subsequently develops knowledge through this series of connections. The personal learning network can be a rich source of learning that fosters connections that become part of our professional development as the quotation at the beginning of the post from Metcalfe describes. Yet building a PLN takes time, energy and purposeful actions, which is why I find it helpful to delineate the two concepts. A PLE can be created independently, building and collecting content sources from the Web, including creating content through blogs, podcasts, Slideshares, etc. A natural extension of one’s PLE is the development of relationships with individuals that emerge from the process of building the PLE, which is how the PLN develops. When connections from a PLN are engaged, knowledge creation becomes interdependent. I will use my own PLE building experience to illustrate the process of developing a PLN, which I have developed through a variety of vehicles: this blog, Twitter, Pearltrees, Goodreads, and by participating in various MOOCs. This process has allowed me to establish personal connections with numerous knowledgeable and interesting individuals. 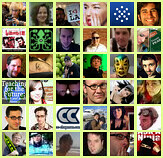 I developed the majority of these friends through comments on blogs [mine and theirs], Twitter and email. 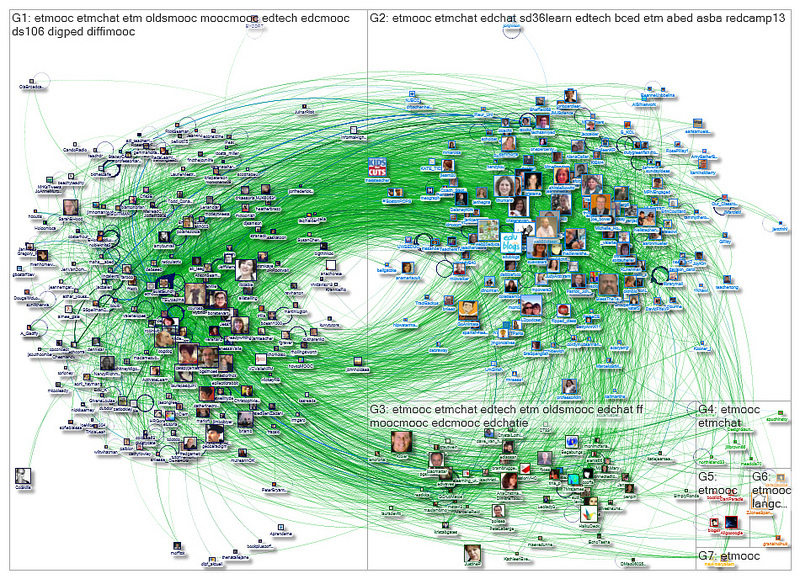 That is the beauty of a PLN, it is dynamic—expanding and contracting as time and energy allows. The nature of cMOOC is to learn, to connect, to share and create knowledge, which makes MOOCs an ideal venue to build a PLN. Though the level of participation and involvement is up to the learner, if one does not want to, or is unable to build personal connections due to time constraints, that is acceptable and appropriate, there are no rules to cMOOCs. However if building a PLN is a goal, the onus is on the individual to reach out to make connections and develop learning relationships. Participate in the introductions by creating a personal introduction and by reading others. In a large MOOC it’s impossible, and unnecessary to read all. Engage with participants through introductions by commenting on fellow participant introductions, two or three is ideal. [Try to] Participate in at least one of the events planned for a given week, i.e. webinar, Twitter chat, or Blackboard session. It is through these interactions that you are likely to find someone with a common interest. All the MOOCs I’ve been part of, have a community of organizers that provide support and resources in all aspects of participation, for example how to participate in a Twitter chat, how to use Twitter or set-up a blog etc. etmooc is a good example of such support. Participate daily (if possible), by reading blog posts, daily updates, following/participating in Twitter conversations. Contribute and share by commenting on others’ posts and engaging in conversation. I have found it is through conversation within a blog’s comment functions that I first established my PLN connections. I aim to be supportive of readers that do take the time to comment by responding to their comments and reading their personal blogs. Look for opportunities to join and participate in sub-groups that often form within a MOOC. 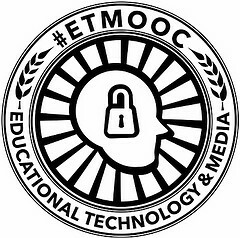 As we see from the web diagram of the etmooc, there are hundreds of participants—it is through the more intimate groups that spontaneously develop where more meaningful and deep connections are made. Developing a PLN does require a commitment of time and energy, but the rewards are abundant. Not only does interacting within a virtual space satisfy the need for social interaction and connection, it also can be the method of professional development, personal satisfaction, relevance, adaptability, and most importantly—may allow us the opportunity to make a difference. Students that are enthusiastic about online learning cite numerous reasons for preferring the virtual format, yet it’s flexibility that is extolled most often – the ability to study and learn on ‘my time’. Ironically, it is this convenience factor that can cause some online students to procrastinate, or worse fail to engage in the learning process at all, which often leads to students dropping out or performing poorly. As discussed in previous posts, a key factor to student success in the online environment is self-direction, the capability and willingness to direct one’s own eduction. Online students, more so than traditional students, need to be independent and take responsibility for their learning. Self-directed learning involves a specific skill set: organization, motivation, and a sense of confidence. 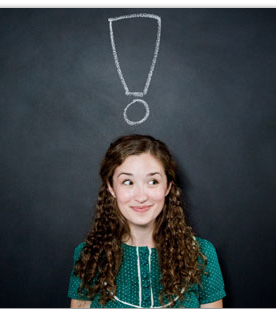 The question—can online students ‘learn’ to be self-directed, or is self-direction innate? Most educators would agree there is an element of both at play. Intrinsic motivation is needed for learners of any age in any situation, though for the most part self-direction competencies can be learned, that is specific behaviours can be practiced and implemented. In this post I write for two sets of readers, first for online students. I’ve included a five-step strategy that includes a set of behaviours ‘real’ students have identified as crucial to their success in completing online college courses for credit. For educators, I’ve included a set of suggestions, actions that support students in becoming self-directed learners, one of which involves giving the responsibility to the learner, a critical component in the instructor-learner relationship. Outline expectations for students thoroughly, By articulating expectations and the role of the student in the course, we ‘give’ the student the responsibility. Expect questions in the first two weeks of the course. This is the ‘syllabus blues’ phase. Students require more support during this phase than any other. See my post here that describes this phase in detail. Respond promptly to student questions. The twenty-four hour rule is a good benchmark. Online learning has its rewards for both students and instructors, as well as its challenges as we’ve explored in this article. But with a sound strategy for learning, a strategy for education that is specific to the online environment, students have the opportunity to be successful online students and life-long learners. I very much like this quote that applies to both students and instructors, ‘learning is not a spectator sport’. Author Vincent Tinto could have been writing about distance education when he wrote his book Leaving College: Rethinking the Causes and Cures of Student Attrition, but he was writing about the drop-out phenomenon in traditional colleges. Yet this quote is relevant to distance education today, perhaps even more so as educators wrestle with the high drop out rates of some online courses, specifically MOOCs. In recent posts I’ve written about how course instructors can support online learners, how to consider the needs of the learner and guide them through phases of dependency to independence. Yet what is the responsibility of the learner? What role does the online student play in his or her learning? And how can this be communicated to him or her? In this post I discuss learning models that assign responsibility to the learner, how these principles can be applied to online learning, and finally describe how instructors and institutions can hand over responsibility to the student. Which Learning Theory Applies to Online Learning? Of the numerous learning theories that have emerged in the past there are assumptions made about the characteristics of the learner. Distance learning has often been associated with adult learners. Adult learning theories – for instance Malcolm Knowles’ Andragogy Theory or K.P. Cross’ Adult Learning Theory, both suggest that the adult learner requires motivation, a drive to learn, life experience to apply to the learning situation and a sense of self-directedness. And, more recently the Connectivism Theory, similar to J. Bruner’s Constructivist theory, is associated with networked learning and Massive Open Online Courses. This theory suggests that learners come to a course already motivated, seek to engage with the content, other learners and construct new knowledge. We can apply some of these principles to online learning credit courses, and go one step further by communicating to the learner what they are responsible for. 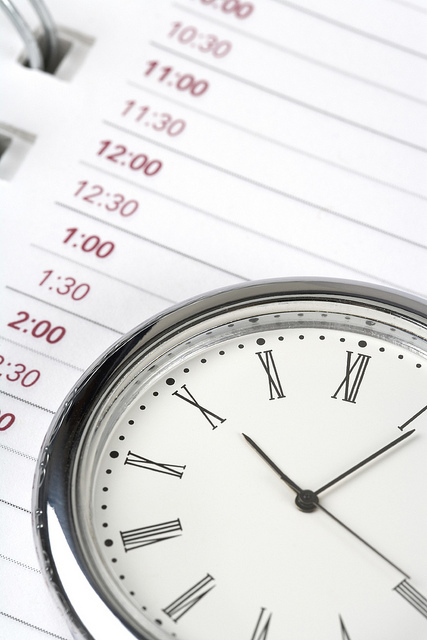 Time management and organization skills where the learner is able to complete assignments within due dates, manage course materials and content effectively. Motivation and drive to learn demonstrated through participation in forums and/or group work. The drive to ask questions and seek instructor support. Strong writing skills where the learner can create discussion posts and interact with classmates. Not to be overlooked are the technical skills learners must possess coming into the course. Learners need to have basic computer skills, such that they can send and receive emails, upload and download files, navigate the Web, source and evaluate digital content. Proficiency in Word and Power Point software is also strongly recommended. One tactic numerous institutions use to reinforce the required skills, is to offer a self-assessment on the school’s website. A ‘quiz’ that will assess whether the learner is ready to learn online. The first step is for the institution to identify what the learner must know, or the skills that are needed. Next, the learner responsibilities must be articulated, recorded and then made accessible to potential learners. Our institution does a fairly good job outlining expectations within the course, but we are lacking in this area (posting on our website for example the skills required). I’ve included several links to schools that do a good job in communicating upfront what is expected of learners. Metropolitan Community College outlines a comprehensive list of Student’s Responsibilities for Online Courses on a web page and divides each into categories, computer skills, communication and participation, computer skills, time management etc. Learners are responsible for completing reading and watching lectures as assigned with module each week. Learners take an active role in discussion forums by posting thoughtful responses, responding to classmates. Assignments must be submitted on time, late work will not be accepted unless student contacts the instructor prior to the due date. These are just a few examples – instructors can customize student expectations to fit the course’s uniqueness. Including these responsibilities upfront, at the beginning of the course is necessary. It calls attention to the responsibilities – gives the learner the chance to be successful. Instructors don’t need to shoulder the entire burden of the online student’s success. The learner is responsible for his or her own learning, yet institutions and instructors can ‘give’ the responsibility to the learner by outlining what it ‘looks’ like.